Putnam County Playhouse: LET'S GO INTO THE WOODS! 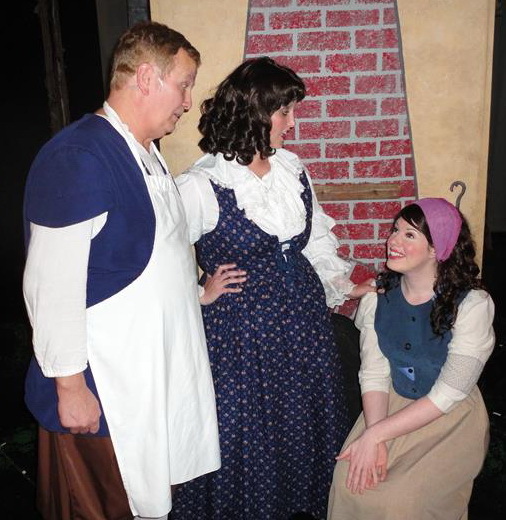 The Baker (Ric McFadden), his Wife (Kayla Myer) and Cinderella (Meghan Armitage). INTO THE WOODS ENDED ITS RUN ON AUGUST 15!! The third production of the 54th season of Putnam County Playhouse is the musical Into the Woods. The Tony-Award winning show has music and lyrics by Stephen Sondheim and book by James Lapine. Stage director and musical director is Lee Reberger. Pit conductor and pianist is Marilyn Burdsall Rush. She will be joined in the pit by Lynne Tweedie-Wurster on keyboard, Drew Brattain on bass guitar, and Michael McClaine playing percussion. This is Lee's first directorial assignment at PCPH. 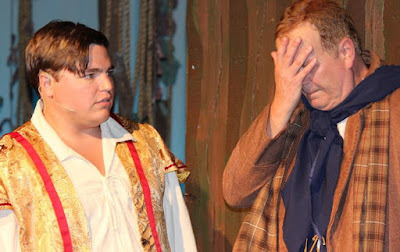 For the last eight years, he has been president and principal director at Community Theatre of Clay County. Linda Gjesvold is scenic designer. Shelly McFadden served as costume designer. Light design is by Bryan Schroder, and sound design is by Craig Armitage. Choreography is by Sarah Bond. Production stage manager is Jessica Masner. Linda is designing sets for all four productions this season. Shelly directed and costumed the first show of the season Seven Brides for Seven Brothers. The musical originally opened on Broadway in November, 1987, and ran for 765 performances. It was nominated for ten Tony Awards and won three: Best Score (Sondheim), Best Book (Lapine), and Best Actress in a Musical (Joanna Gleason in the role of the Baker's Wife). The original cast was reunited to tape the show for PBS in 1989. An Into the Woods revival opened on Broadway in April, 2002, and ran for 279 performances. The cast was included Vanessa Williams as The Witch. It won Tony Awards as Best Revival of a Musical and Best Lighting Design. A London production opened in 1990, and revival was presented there in 1998. The actress playing the Baker's Wife in both productions (Imelda Staunton, then Sophie Thompson) won the Oliver Award for Best Actress in a Musical. The latest professional productions include an Off-Broadway version opening in January, 2015, and a production at the St. Louis MUNY that closed on July 28, 2015. 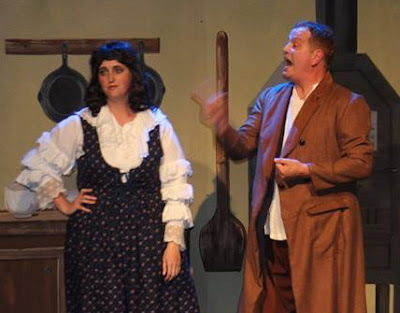 The PCPH cast is headed by Ric McFadden in the role of The Baker, and Kayla Myer playing his Wife. The Witch is played by Shelly McFadden. 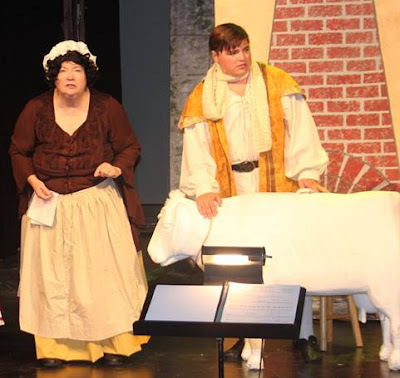 Other leading roles include Jack played by Cameron Callan, Jack’s Mother played by Kathi Elliott, Cinderella played by Meghan Armitage, and Andrew Ranck as the Narrator. Other roles are Little Red Riding Hood, Samantha Flannelly; Cinderella’s stepmother, Mira Hoffman; Cinderella’s stepsisters, Hannah Brattain and Sarah Arnold; and her real parents, Jim Rambo and Robin Schneider. Brad Sandy is The Wolf, Dale Grove is the Mysterious Man, and Eleanor Howard is Granny and the voice of the Giant. 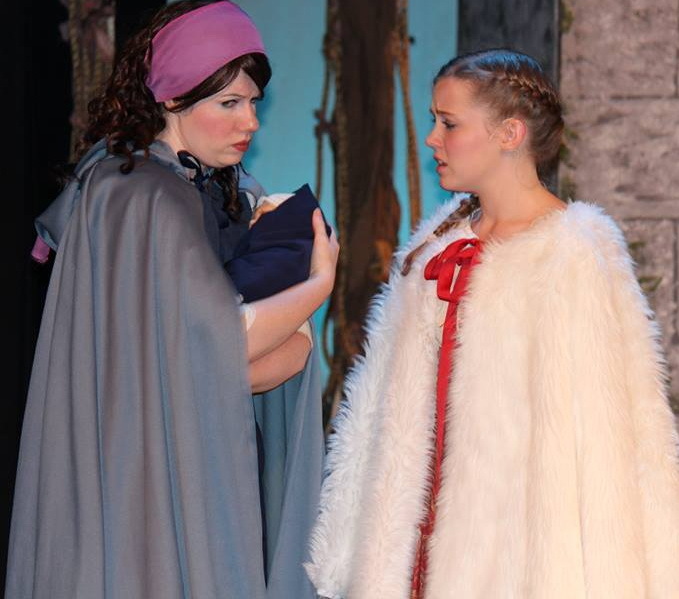 Michaela Semak is Snow White, and Chloe Hayes is Sleeping Beauty. Abe Anglin plays the Prince’s steward. Cinderella (Meghan Armitage) and Little Red (Samantha Flannelly). Elijah Brattain is the prince in search of Cinderella, and Jake Glidden is the prince in search of Rapunzel, played by Sarah Bond. Elise Merrell is running the sound board, and Alex Briones is running the light board. Spotlight operators are Brandon and Cameron Wunderlich. Working on the stage crew are Rachel Lubinski and Aaron Swartz. Jack (Cameron Callan) and The Baker (Ric McFadden). Our 2016 season lineup will be announced during the Curtain Speech at Into the Woods! The 54th season concludes in September with a production Ken Ludwig's mystery-comedy The Game's Afoot: Or Holmes for the Holidays.